Today started off good. I got to meet up with my friend and DK guru Brandon "Bru Man" Foster for a morning surf. Brandon is one of the most traveled bodyboarders in the world and he gives me the best advice for my career along with the best stories from the road. We went to wedge to shoot some video with Chad Stickney. Chad made Segergation one and two. You can buy them online at the Alternative Surf website. My first wave my hair was dry like this clip I saw of Robbie Crawford in a Rot video back in the day and when the wave spit my hair went completley wet it was pretty funny and can't wait to see it on film. 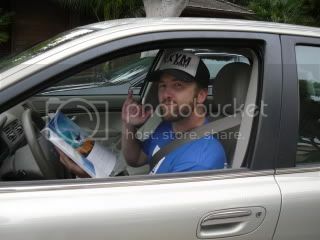 Brandon Foster checking out the new Riptide mag I got. Thank you Mike for sending it to me!!! After our session we headed to a Sport Chalet bodyboard clinic for there employees to learn how to bodyboard and sell them! It is a cool event and you get to hang out with all these cool people and want to learn about bodyboarding. The employees are a lot of help and are always stoked to get in the water which is always refreshing. I couldn't stay the whole time cause I had to do a few things with the Mike from Wave Rebel for some future Wave Rebel stuff!! 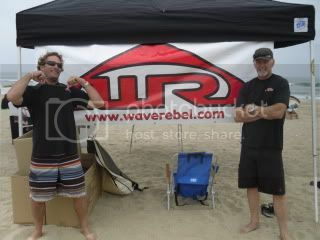 Mike and Terry holding down the Wave Rebel tent! My friend Jayden has got the boogie addiction lately and it was so cool to hear how into he is getting. 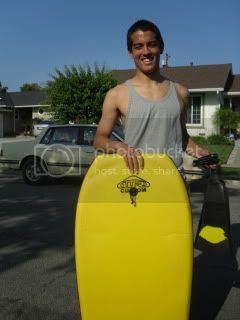 I went to seal today to catch up with some old friends and I saw him there, he was rocking a super old beat up board. He lost his fins and was still stoked to just to be at the beach with his friends. He needed some new stuff and I was stoked I got to hook him up! Jayden you got two in a half months till I see ya again so keep practicing and having fun!!! Since I wont be home for Fathers day or my brother Jasons birthday I decided to take them out for some food and a movie. It was a epic time! Emma got to come to and we went to Deli news and got Pizza and saw the new movie UP. 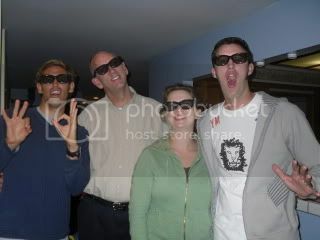 We got to see it in 3D and it was CRAZY! I definetley recommend it. Click this to see a preview of the movie.